What are the SMTP settings of Gmail? That’s an easy question. Gmail is a fantastic webmail application, but some people find it handier to access their own inbox from an email client like Thunderbird or Outlook: to do that it’s necessary to configure its outgoing server entering the right settings. 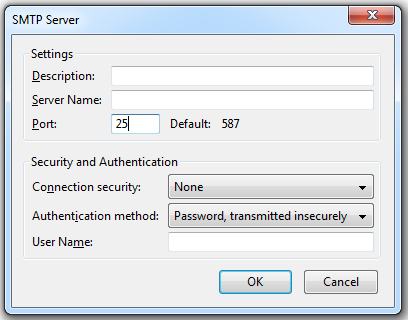 Then you can choose your security and authentication options: for further information please check our article about SMTP configuration. (And of course you can use also Gmail’s POP details to receive emails). Remember however that Gmail’s SMTP comes with severe sending limits in order to prevent spammers from using its outgoing server to blast out garbage emails. The boundary is 100 recipients a time and 500 messages per day: if you cross this restriction, Google will block your account. Plus, its SMTP server relies on shared IPs that cannot guarantee you a full deliverability, as they be used also by spammers who harm seriously their reputation, thus increasing the chance that also your legitimate email will be filtered out by antispam systems. So if you’re setting up an email campaign or need to send unlimited emails, the best thing to do is to choose a professional SMTP server: for a very reasonable price you will be able to mailout to a large lists keeping with the certainty of the highest delivery rate.